Mercedes-Benz is not standing still in their global product offensive, and the U.S. market will see five new models that are at the New York International Auto Show. The new 2014 C63 AMG “Edition 507” is coming with even more power and performance with coupe, sedan and wagon variants. 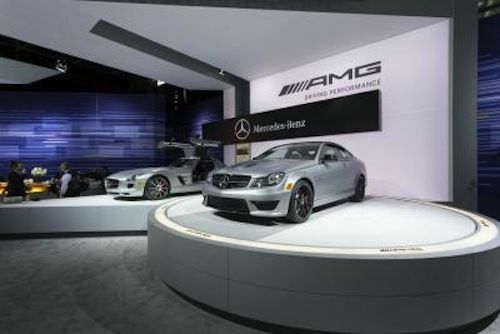 Other newcomers will include the battery-electric B-class Electric Drive and the high-performance CLA 45 AMG four-door coupe, both of which are celebrating their world premiere at the 2013 NYIAS. Also making their U.S. debuts will be the series-production version of the new CLA-Class, the all-wheel drive wagon version of the E 63 AMG S-Model, and the smart fortwo electric drive. Mercedes is bringing an onslaught of new vehicles to the U.S. and to other global markets in 2013. The German automaker saw record sales in 2012 and they are continuing the momentum with more new models. Dr. Joachim Schmidt, Executive Vice President Mercedes-Benz Cars Sales & Marketing said, “The new E-Class will reach the market in two weeks and, based on the excellent feedback we have been receiving, will certainly deliver a powerful sales impulse. We are expecting further volume growth in the second half of the year, too, with our other newcomers.” How did Mercedes-AMG increase the power and performance of the new special edition C63 AMG to make it even better for driving enthusiasts? Mercedes bestselling C63 AMG makes its entry as the exclusive 2014 C63 AMG “Edition 507” with 507 hp from the hand-built AMG V8 engine. The new performance AMG gets an increase of 37 kW (50 hp) to 373 kW (507 hp) and a maximum torque of 610 Nm (450 lb.-ft.). The power increase comes from technology from the SLS AMG that features forged pistons and the lightweight crankshaft. The new 2014 C63 AMG “Edition 507” is available from Mercedes as a sedan, wagon and coupe. The special edition definitely pushes the envelope and is aimed at driving enthusiasts who take pleasure in high-performance, top-flight technology and an array of exclusive design and equipment details. Mercedes says the new 2014 C63 AMG "Edition 507" coupe and sedan will launch from 0-60 in 4.1 seconds. This new high-performance model outperforms the existing 451 hp C63 model by three-tenths of a second, and the variants with the AMG Development Package which produce 481 hp and will be two-tenths of a second faster. It will also have a top speed of 174 mph. Those numbers should make any performance enthusiast smile. Other performance enhancements included on the new 2014 C63 AMG "Edition 507", include a more powerful AMG high-performance braking system featuring compound construction technology. Mercedes is also giving the exterior of the C63 AMG "Edition 507" some exclusive new design features. The hood originates from the C63 AMG Coupe Black Series that Mercedes introduced late last year. An AMG sports stripe applique in matte graphite grey is located above the rocker panels and sets the "Edition 507" apart from the standard version. Mercedes is also offering "Edition 507" buyers the choice of three different equipment and options for the interior. Mercedes is expecting the C63 AMG "Edition 507" to help the company increase sales in the U.S. market. “We have made an excellent start in 2013 and expect our first quarter sales in the U.S. to be the best ever. The new models will help us surf high up that success wave as the year continues,” says Stephen Cannon, CEO and President of Mercedes-Benz USA. The model's sales release is scheduled to begin on April 8, 2013, while the market launch in Germany will commence in June of this year. The 2014 Mercedes-Benz C63 AMG "Edition 507" coupe, sedan and wagon will be available in the U.S. this summer. Pricing will be announced closer to its global market launch. Performance buyers who choose the new special edition C63 AMG will get a level of performance that pushes the performance envelope more than ever before.